The Biltzen is designed by Mad Max team and Geekvape. The intake design of the two groups of 16 holes is very good for the control of the draw resistance. It also can be used with the extension ring of the airways to upgrade the oil storehouse from 2ml to 5ml. 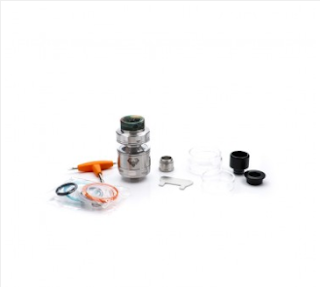 The three specification suction nozzles by one of the GreekVape strengths, also make it more widely used. Although the location is mainly in the big smoky and fancy smoke ring, there is still a satisfactory resolution in small or medium intake. The features such as easy oiling cotton, without pole make it convenient to use. It is really a charismatic product. 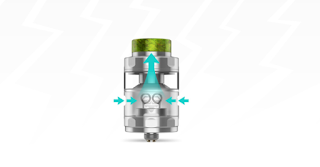 The Biltzen Atomizer has a good sense of design with the attached nozzle. 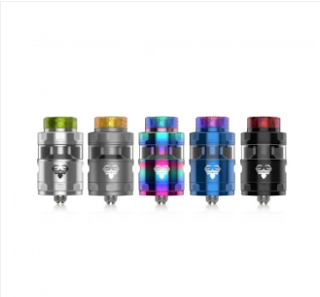 The 810 wide mouthed nozzle of the Blitzen atomizer is even more beautiful. And the other 810 nozzle is a translucent long nozzle with PEI material, which has both heat insulation and gathering. Naturally wide and narrow condensing reflux is indispensable.The injection ring of the double kidney shaped oil injection hole is to reduce the length of flue gas as much as possible. The thickness is very thin, which makes it not easy to disassemble in bare hands. The attached screwing or ceramic clip is required if you need to disassemble it.